It's the middle of January and the beginnings of a new year. 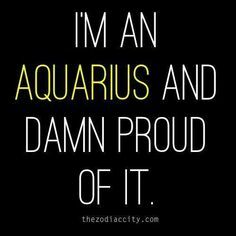 And that means that it's time for Aquarius Birthday Girl to swim out and party! Here are some cool reasons why Aquarius Birthday Girls rock the birthday party! Like other zodiac signs, Aquarius is super super independent. It's part of themselves. They really need to feel in control of their life to feel free. Freedom is essential to an Aquarius. Nothing can hold this Birthday Girl down! Although Aquarius may seem detached and distant, they treat their friends with respect and love to make them laugh! Many friendships they have often are no strings attached kind of deals, but they will care for their friends no matter what. They will often make random plans to do something or to go somewhere! So when an Aquarius offers an adventure, go for it! Aquarius Birthday Girls are super smarties! They love to have intellectual conversations and probe minds with other smart people. They love research articles, new ideologies, and new ways of thinking. They would be awesome people for jobs such as psychologists, social workers, professors, or any profession that's involved with thought and interaction. Aquarius girls need some alone time too. Going to all those birthday parties and social gatherings can be hard on her, so understand if she needs some time to recover, read a book, watch that new TV series, etc on her time. Introverts need their time alone sometimes, and many people don't understand! She'll always give you the truth and nothing but the truth. Sometimes we need some tough love and encouragement from our friends, and an Aquarius does just that. Sometimes her words can be very shocking to hear, but an Aquarius always uses facts and her best judgment to tell her opinion, very honestly.